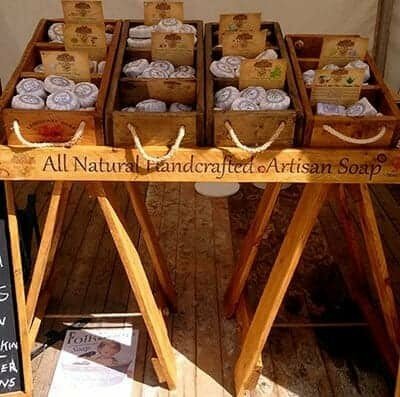 We are a small natural soap making company, we supply a number of local health and environment conscious outlets. We AVOID PLASTIC POLLUTANTS and soaping agents such as SLS, that are a KNOWN IRRITANT on sensitive skin and we NEVER USE animal fats in our soaps such as tallow (beef fat). I’m a soap making lady from the Valleys. I live with my musician partner of 26 years and Son. I have two grown up boys, two grandsons, two sisters and two dogs! good things come in pairs. My interest in nature and crafts are the inspiration behind my love of natural soap making. The less of an impact on the environment I have in my day to day life the happier I am. If I source products locally and make, rather than buy mass produced I am not only supporting local businesses and doing my part for the environment but also supplying a superior quality product that can help with many skin conditions. My natural soaps have shown to be beneficial for a variety of skin conditions including, eczema, psoriasis, dermatitis, acne, spots, uneven skin tone and rosacea. I practice both the hot and cold process methods of soap making. I am always careful not to cook out any of the beneficial ingredients, therefore making the product the very best it can be. Soap making for me started many years ago, I have always loved a variety of ancient crafts. Being extremely proud of our soaps, I spent almost a year testing and fine tuning the recipes to be a perfect balance of oils and natural ingredients. The selection of natural soaps from Folk Soap deliver an abundance of beneficial suds that last longer than any mass produced bar. Our Folk Soap is produced from locally sourced materials in Wales.